Ursula Tyrwhitt (1872-1966), the artist of this watercolour sketch, was a student at the Slade School of Art where she became a close friend of Gwen and Augustus John. She worked in Paris at the Atelier Colarossi, and later studied at the British School in Rome. She exhibited at the New English Art Club, becoming a member in 1913. She also collected paintings including works by Gwen and Augustus John, Walter Sickert, Stanley Spencer, Philip Wilson Steer, Margaret Fisher Prout and Ethel Walker, many of which were bequeathed to the Ashmolean Museum in her home town of Oxford. 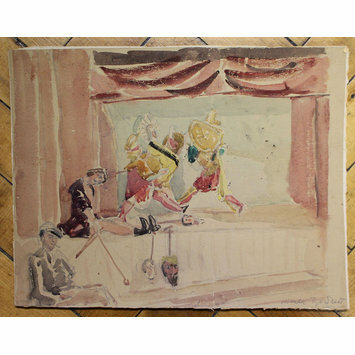 The Ashmolean held a retrospective exhibition from October to November 1973 entitled Ursula Tyrwhitt, Oxford painter and collector 1872-1966, with a forward in its catalogue by the dance critic Richard Buckle (1916-2001), from whom this was acquired by the V&A. Ursula Tyrwhitt worked mainly in watercolour, and several of her sketches were painted in the Mediterranean. The subject of this work is a puppet show that she would have seen in Sicily. Large and heavy rod puppets were used, operated from above by puppeteers standing on a bridge over the stage. Since these puppet shows invariably featured battles between the Knights of King Charlemagne and the opposing Saracen invaders, the puppets’ heads were made to separate from the bodies after particularly nasty beheading sequences during the action. One such separated head can be seen on stage, with another two on their rods hanging from the stage, near another puppet waiting to be used. 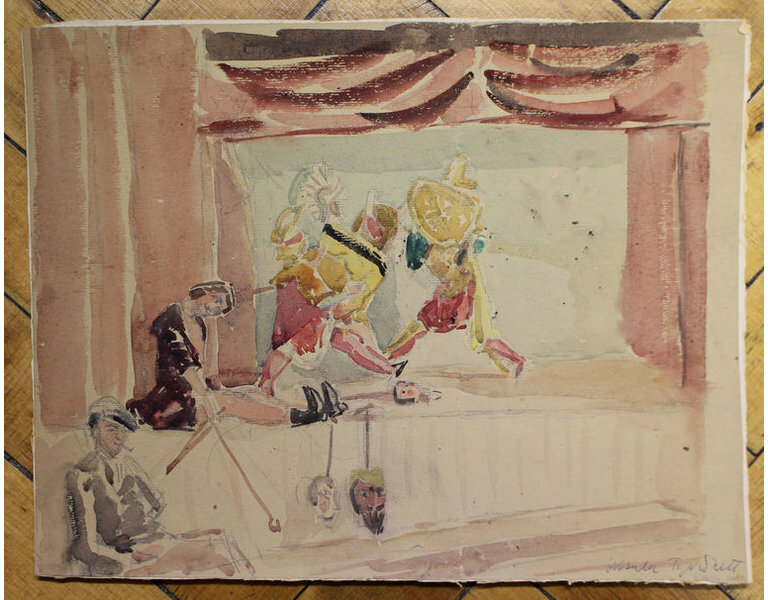 Watercolour on paper mounted on card depicting Sicilian rod puppets on stage performing a battle, with another puppet and puppet heads around the stage, and a seated man in the foreground. Signed in ball point pen bottom right Ursula Tyrwhitt.